Hooray Yippee & Cheers for you! 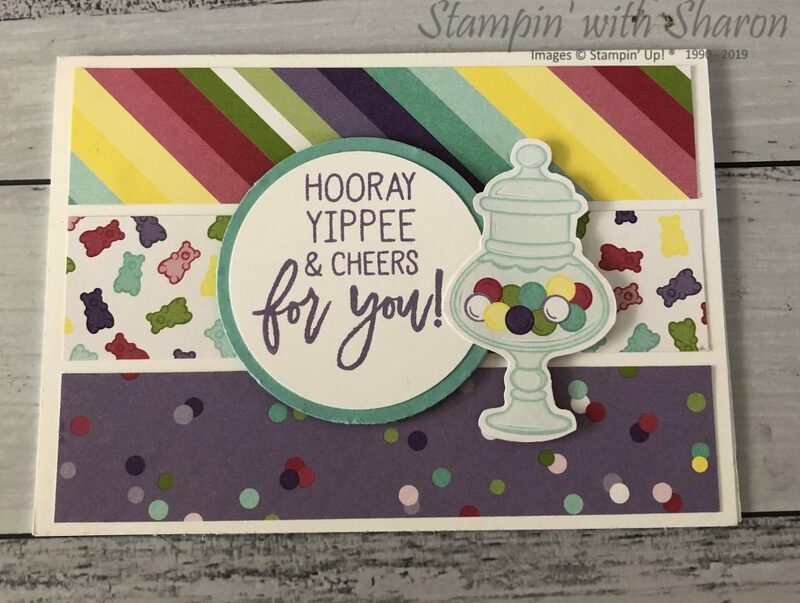 I am loving the colours in the “How Sweet it is” Designer series Paper (DSP) and created this card for one of my classes. I just love how simple this card is to make. All I have done is cut the DSP into strips to fit on the card front. Punched out a couple of circles or you could die cut them using the layering circle framelits. I fussy cut the jar out leaving a small amount of white around the outside of the jar. Stamped the sentiment onto the circle and layered it up onto a Coastal Cabana circle. I stamped the sentiment in Highland Heather ink. What do you think of this card? It is one of the cards that my campers will make in a couple of weeks at my papercrafters retreat. Tomorrow is the very last day to earn any rewards for Sale-a-bration. I will be closing off my March Host orders tomorrow at 8pm (Sydney time) so if you’d like to place an order and earn some last minute rewards, then place your order before 8pm. This entry was posted in 2018-2019 Annual Catalogue, Designer Series Paper, Occasions Catalogue, Stampin' Up and tagged Birthday Cheer, How Sweet it is, Occasions Catalogue by sharon. Bookmark the permalink.